The Chicago-based CME Group Foundation today (12 September) announced it will provide strategic support and grants of $384,000 to the two universities in Northern Ireland for the development of educational programmes for financial engineering postgraduate and doctorate scholarships and training for computing and coding teachers. Queen’s University Belfast will develop courses for over 140 GCSE computing teachers to equip them with the skills to both successfully teach and inspire pupils to study the computing and coding to a high standard. Ulster University will fund postgraduate and doctorate scholarships as part of the university’s Financial Engineering project which aims to address, and provide a solution to the immediate and long-term skills requirement for expertise in financial technology within Northern Ireland. Kassie Davis, Executive Director at CME Foundation said: “CME Group Foundation is proud to offer the support to these two institutions and to the valuable work they are doing for the sector and for their students. Professor Gillian Armstrong, Head of Department of Accounting, Finance and Economics, University of Ulster added: “Ulster University Business School has received invaluable support from CME Group Foundation since 2015. This further investment will enable a new cross faculty Financial Engineering initiative targeting the immediate and pipeline skills requirements for expertise in Financial Technology across Northern Ireland. CME Group is the world's leading and most diverse derivatives marketplace offering the widest range of global benchmark products across all major asset classes. The CME Group Foundation, which was created in 2008, works to advance the economy by supporting education from cradle to career by partnering with universities, school districts, charter networks and non-profit organizations that work to ensure at risk young children are prepared for kindergarten. For further information on CME Group Foundation, please contact Fleur Binyon, Manager, Corporate Communications, on tel: +44 (0)20 3379 3831. 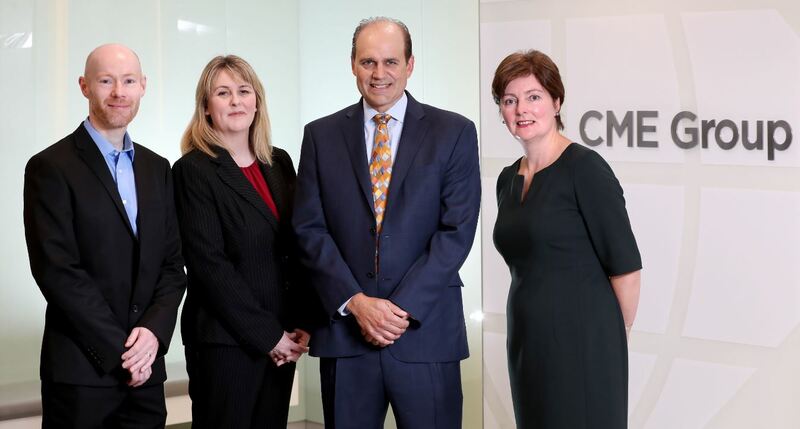 Caption (L-R): Dr Philip Hanna (Queen's), Alison Hamilton (Head of CME Group, Belfast), Kevin Kometer (Chief Information Officer, CME Group Chicago) and Professor Gillian Armstrong (UU).